Every year a weapons manufacturer claims they have developed a new system and it is the latest and greatest thing to arrive since we were throwing spears. However, these claims are normally found to be without merit or validity. I feel as though Sig has truly introduced a weapon that has changed the game when it comes to a truly versatile AR platform weapon system. I know this weapon has been on the market for almost 2 years, and I always try and wait until the bugs are worked out before I rush to judge, jury and convict something. The MCX was designed from the ground up as a modular weapon that is extremely versatile and that you can change on the fly. 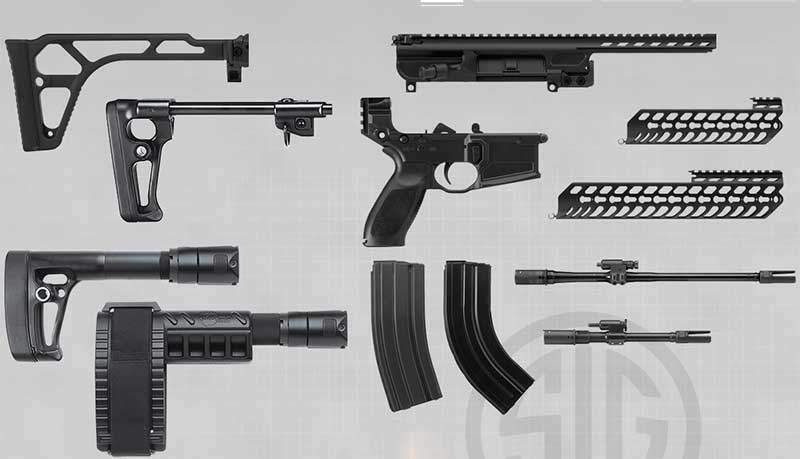 It is built around Sig’s highly reliable gas operated short stroke piston system. It is loaded with features that will allow an operator to make adjustments as they are warranted. Auto regulating gas system that allows you to switch between supersonic and subsonic loads. Suppressed or Unsuppressed operation without having to manually adjust the gas settings. It is designed to easily configure to 3 calibers- .300 BLK, 5.56 NATO and 7.62X39mm. Tactical ambidextrous safety, mag release and charging handle. Oversized mag paddle for easier magazine exchange. Fully locked and closed rotating bolt system. Ok, let’s talk about the MCX’s stock options. This weapon has many different stock options to fit your needs. They make a skeletonized folding stock that would be great for CQC and building clearing. It also can be paired with a typical 3 position adjusting tactical stock. You can also get a telescoping stock that slides in instead of folding and it also is a multi-positioning stock. You can also get a pistol grip style stock in the SBX stabilizing brace option. The MCX has made it easy for the operator to change out barrels. You simply loosen 2 screws on the upper receiver. Both 9” and 16” barrels are available and you can quickly change from .300Blk to 5.56 NATO with a barrel/operating rod swap. If you wish to swap out to 7.62X39, you will need to change out the magazine as well as the barrel. The MCX’s upper is completely compatible with any standard mil-spec AR-15 lower. The MCX is primarily designed to be paired with SIG suppressors, but will accept the suppressor of your choice given the 1/2X28 or 5/8X24 threaded muzzle devices. How accurate is the MCX? I was impressed by the accuracy of the stock Sig MCX. After we tweaked it a bit and put an Eotech and other mods on the weapon it was just what the Dr. ordered. This weapon has a great feel and flow and Sig was careful to pay attention to the most miniscule detail to make sure this is the AR weapon of the future. The stock MCX carbine retails for around $1,800 while the SBR and SBX are around $2,100. I feel as though this is a weapon that is ready for tactical teams and the civilian alike. It is loaded with features and backed by a name that all gun enthusiasts can trust.